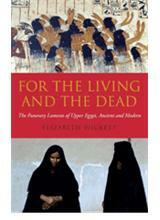 The funeral laments of Upper Egypt have an elaborate and ancient history stretching back more than 5,000 years. Even the chants of modern-day lamenters, echo the words of their ancestors. Yet this ancient tradition is now under threat from social and political change. The laments - known as idid in Arabic - are composed orally in performance. Elizabeth Wickett explores the performance, motifs and meanings of the laments and reveals their relation to myth, religion, cosmology and the ancient Egyptian funerary texts. The author was given unique access to this fast disappearing tradition, and her book provides a unique cultural archive that will interest Egyptologists, archaeologists, anthropologists, ethnomusicologists and all those with an interest in the language and culture of the Middle East. Elizabeth Wickett has worked in the Middle East and North Africa for more than twenty-five years in academic research, anthropological film and development. She studied with Dell Hymes at the University of Pennsylvania and has lectured widely on Upper Egyptian folk genres and performance. She produced and directed the successful documentary, For Those Who Sail to Heaven, highlighting the legacy of ancient festival tradition in Luxor. Request: For the Living and the Dead .